» Battle Royale — Koushun Takami. We have forty-two junior high students who are in the same class whisked away to a deserted island on a fight to the death. Each student has a collar around their neck, and they each get a backpack with a weapon, which does not always have to be useful. ( damn Yutaka, a fork. ) Announcements are made on the island every six hours, announcing the dead and the zones on the island that will become forbidden. If you walk into a forbidden zone, the collar blows your head off. The Program continues until only one student is left. 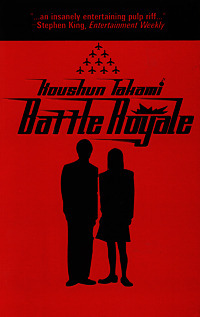 I absolutely loved Battle Royale. The fact that the players are classmates, some knowing each other their whole lives, only added to it. The characters were all different and unique, and somehow it was simple to keep track of them all. You really feel the emotion of each student, and the battle scenes are very realistic. The violence is graphic, but it adds to the novel. It makes a point. In most books I read, it is usually meant to entertain, while here it really reached out and grabbed you. It makes you realize how hopeless and awful the situation of the students' is. How easily some people can play the game and how fast lives can end. About ten people are dead already in a couple of chapters. I do believe Suzanne Collins heard of this book and used it as a basis for The Hunger Games. There are just too many similarities, yet the stories are different. I actually prefer Battle Royale. The characters have more depth, there is more to the plot, and all of them are regular kids with some never even holding a weapon in their hands before. As I mentioned before, in this novel, the violence makes more of a point. The ending was completely brilliant. I absolutely loved it. It was completely unexpected, and very well executed. I would not recommend this novel to anyone with a weak stomach. For example, if you found The Hunger Games disturbing, the violence in this would probably distract you from the whole book and just make you nauseous. » The Angel Experiment — James Patterson. » Charlie and the Chocolate Factory — Roald Dahl. » Diary of a Young Girl — Anne Frank. ★★★★★ — amazing / masterpiece. Natalia has read 28 books toward a goal of 100 books.